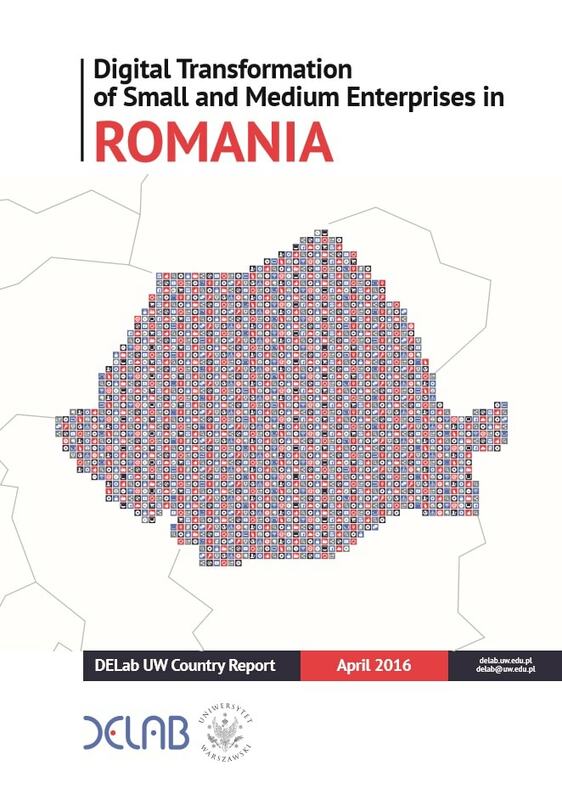 In this report we examine the level of digital transformation of SMEs in Romania in comparison to SMEs from other EU countries. We take into consideration both the digital business environment (digital infrastructure such as Internet availability and digital skills of human capital) and the adoption of digital technologies. The introduction of digital technologies such as websites, social media, e-commerce, electronic information sharing and cloud computing simplifies and accelerates decision making, allows effective brand building, facilitates transactions and makes it possible to reach new customers. Are Romanian SMEs ready to compete on the Digital Single Market? Our analysis suggests that Romanian SMEs strongly require a digital makeover. Romanian SMEs are the least digital in the EU, making no use of of e-commerce tools, cloud computing services and electronic information sharing tools. Unfortunately, Romanian business may lack the basic foundation for digital development: an appropriate digital infrastructure with high Internet coverage and a digitally skilled labour force. 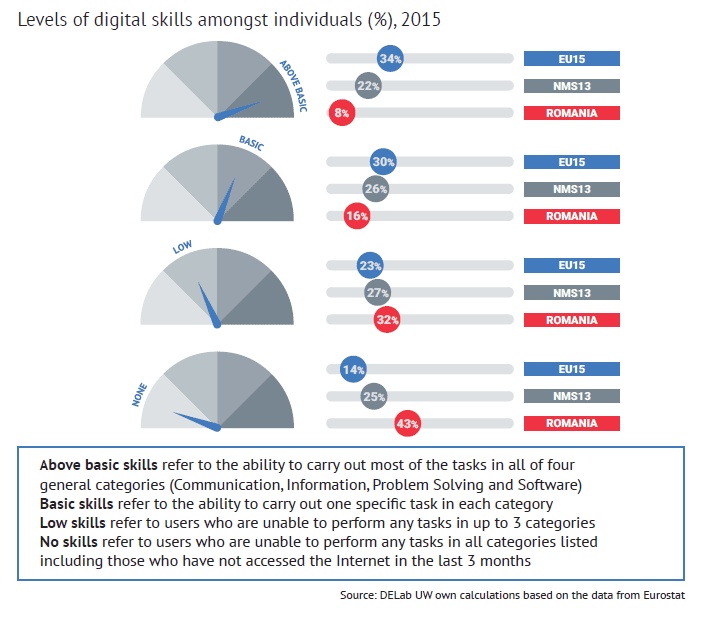 The poor digital skills of Romanian society creates an especially big obstacle for going digital. 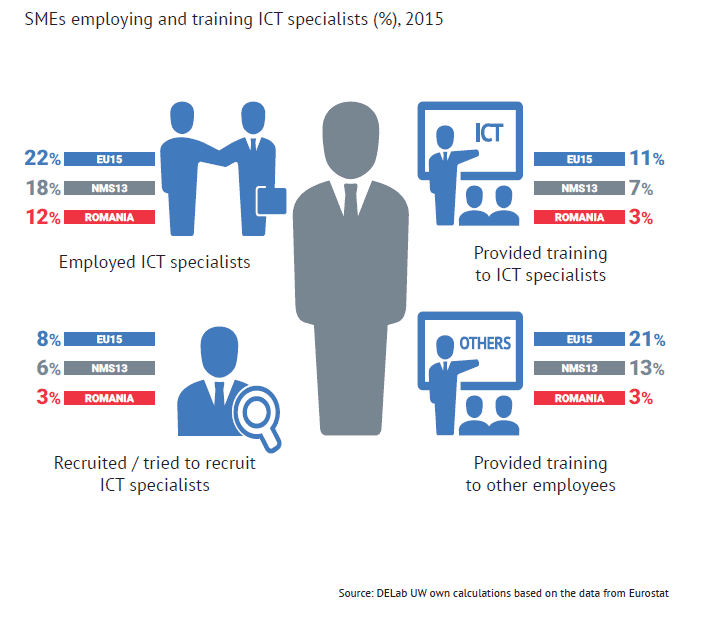 Furthermore, enterprises do not invest in digital training for their workforce. As a result, according to the indicators measuring digital transformation of economy and society (DESI), the country takes the last place among the EU28 and falls considerably behind other NMS13 countries.